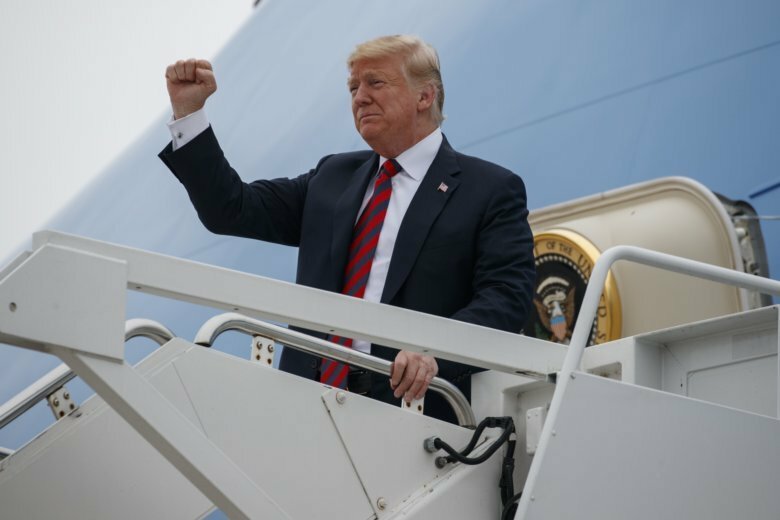 BRIDGEWATER, N.J. (AP) — As Air Force One streaked across the desert sky and Las Vegas faded in the distance, President Donald Trump began seeking opinions. The TVs on the plane, tuned as always to Fox News, carried headlines about an explosive new story: Deputy Attorney General Rod Rosenstein had suggested wearing a wire to secretly record Trump, and raised the idea of using the 25th Amendment to remove the president from office. On the flights both to and from a Missouri rally, Trump polled staff on the plane, called his outside network of advisers and kept a careful eye on what his favorite hosts on his favorite network were recommending. The messages were mixed, but more were in favor of containing the urge to fire Rosenstein, a move that would declare open warfare with the Justice Department and cast doubt on the future of the special counsel’s Russia probe, according to two people familiar with the exchanges but not authorized to publicly discuss private conversations. Trump, though telling confidants that he felt the moment was another example of the “Deep State” and media conspiring to undermine him, held off dismissing Rosenstein. For now. But the aftershocks of the story are rattling Washington still. The details of the memos written by a former deputy FBI director, Andrew McCabe, triggered immediate speculation that the information would give Trump the justification to do what he has long desired: dismiss Rosenstein, the Justice Department official overseeing special counsel Robert Mueller’s investigation of Russian interference in the 2016 election. The story broke as Trump was in his motorcade heading toward a Department of Veterans Affairs event in North Las Vegas, Nevada, on Friday, though some in the White House had been alerted to the report the day before. Rosenstein immediately put out a statement refuting the story and then, after being summoned to the West Wing that evening by White House chief of staff John Kelly, put out a second, stronger denial. At the same time, at a rally in Springfield, Missouri, on behalf of Senate candidate Josh Hawley, Trump made a cryptic remark about removing the “lingering stench” from the FBI and Justice Department but did not explicitly bring up the Rosenstein story. Later, the president angrily asked confidants, both inside and outside the White House, how to respond. He received mixed messages. Some urged him to fire Rosenstein. Others suggested restraint while seeing if the report was incorrect or if it was planted by some adversary. Still others believed that firing Rosenstein before the November election would further the Democratic talking point of an administration in disarray and damage the Republicans’ chances of keeping control of Congress. Trump also received conflicting advice from his other team of counselors: the hosts at Fox News. While Laura Ingraham initially urged Trump to fire Rosenstein, Sean Hannity pleaded with the president not to act. And on Saturday, another Trump cable favorite, Jeanine Pirro, took to Twitter to wonder if Rosenstein himself leaked the story “to force” Trump to fire him. Spending the weekend at his New Jersey golf course, Trump continued to ask allies about the reports and fumed about the involvement of McCabe, whom the president has long believed conspired against him. McCabe was fired this spring not being fully truthful under oath. But the president’s attention was also divided while at Bedminster, as he was focused on developments in Brett Kavanaugh’s Supreme Court confirmation hearings while also being urged by aides to prepare for the upcoming U.N. General Assembly. Trump, never shy to loudly express disappointment in the Justice Department, has not tweeted about the matter. The White House did not respond to requests for comment. Democrats urged that Rosenstein be spared. The report “must not be used as a pretext for the corrupt purpose of firing Rosenstein in order to install an official who will allow the president to interfere with the Special Counsel’s investigation,” Senate Minority Leader Chuck Schumer tweeted. But the reports create even greater uncertainty for Rosenstein in his position at a time when Trump has lambasted the department’s leadership and publicly humiliated both Rosenstein and Attorney General Jeff Sessions. Some of Trump’s fiercest congressional allies had already floated trying to impeach the deputy attorney general. It’s also the latest revelation that could affect Mueller. Sessions withdrew from the Russia inquiry soon after he took office, to Trump’s dismay, and Rosenstein later appointed Mueller. Trump has resisted calls from conservative commentators for more than a year to fire both Sessions and Rosenstein and appoint someone who would ride herd more closely on Mueller or dismiss him. The reported conversation about possibly secretly recording the president took place at a tense May 2017 meeting during the tumultuous period that followed Trump’s firing of FBI Director James Comey. The White House said that decision, which upset many rank-and-file agents, was based on the Justice Department’s recommendation. The Justice Department issued a statement from one of the participants in the meeting who described the remark as sarcastic. Associated Press writer Eric Tucker in Washington contributed to this report.